Expectations of a book are always aroused by the title, cover and author. Since I had never heard of Bill Pfeiffer, I was intrigued — no, excited — at the promise of this book’s title. My personal path has led me through ecstatic dance and ecstatic trance as a shamanic practitioner, so the word ‘ecstatic’ is always one to make my ears prick. For a start, this is a deeply serious book. It’s not a light read, or a puff piece for fluffy sensibilities. It is a manual for building a new form of society. Go back and read that sentence and try to let it sink in. Building a new form of society. It has been tried before, usually with quite outlandish and shambolic outcomes, but Pfeiffer has turned a twenty-first century eye on the problem, taking on board the millennial hopes and utopian goals of previous attempts. His approach is pragmatic and attuned to pitfalls from ego and sectarian politics. His approach is also deep. Deep-deep. In fact, I would go so far as to say, deep-deep-deep. 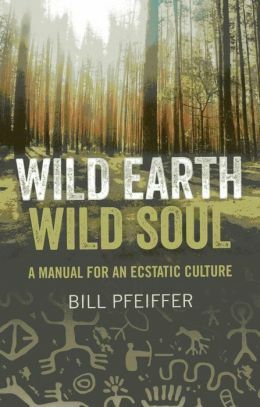 Pfeiffer’s approach is a personal and community-oriented one: through his Wild Earth Intensives, workshops where self-selected individuals come together to learn how to live in and build an ecstatic society. It involves dance, play, music, and the practice of the opening up of the heart to nature and the lessons we need to re-learn. Society at its simplest is the coming together of individuals. In order for that society to function there must be communication, and Pfeiffer makes a very good case for the non-listening aspects of modern, Westernised society. Lately the term ‘emotional intelligence’ has gained ground, and listening is an intrinsic part of this, paying attention with one’s whole being to what the other person — or the rest of society — is saying. It is similar to the resistance we have when faced with meditation, and stilling the millrace of thoughts in the monkey-mind that we have nurtured in our education and society. So, his approach is one from the ground up, where individuals have to rebuild themselves into fit members of this ecstatic society. Previous attempts, in my opinion, have failed because they have attempted to impose diktats of doctrine from the top-down. Nature and permaculture play extremely important parts in building this new ecstatic society, because the goal of this exercise is to have a population on a planet with finite resources that husbands those resources, making them sustainable, instead of depleting what has taken eons to build up. We need to immerse ourselves into the web of being and find our place in the overall scheme of things. This is a handbook, a manual, a workbook for workshops, for putting into practice the skills that we will require as a society to recover from the wounds of industrialisation, rampant capitalism, and short-sighted exploitation of the world’s diminishing resources. There is a time to stop thinking and dreaming — and go right out there and do it. This book can only aid in that exploration.